Whilst on maternity leave, I was casually scrolling along on Instagram, catching up on posts and stories, and I spotted Deepa sharing some behind the scene shots of her struggling to rebrand her logo for Mela Jewellery. I was hooked. The designer in me couldn’t let it be and so I sent her a quick message with a bit of advice to help her out. Little did I know what was about to happen. Being on maternity leave I was reluctant, but eager, to get back into the swing of designing. It was coming up to the end of Summer 2018, so it aligned with my decision to dip my toe back into work, and so Deepa and I met for a coffee and chat. I wanted to make sure Deepa was looking to rebrand for all the right reasons. Deepas existing branding was in need of modernising to attract and reach her target audience (women over the age of thirty with a good disposable income that like to invest in quality clothing and accessories. Also, men! Many men of the same age who buy gifts for their other halves). It was the perfect project to ease me back into my business and Deepa was genuinely very understanding of my situation and her requirements. After we decided we were a good fit to work together (I think this is so important!) Deepa started on her homework tasks. As she completed the workbook questionnaire and the Pinterest homework I could sense this was going to be one of those amazing projects, and I wasn’t wrong! Everything Deepa had written really resonated with me and the Pinterest homework was just drool-worthy. I instantly had a vision for her logo and got a great sense of understanding of her brand! I couldn’t wait to start on the design. 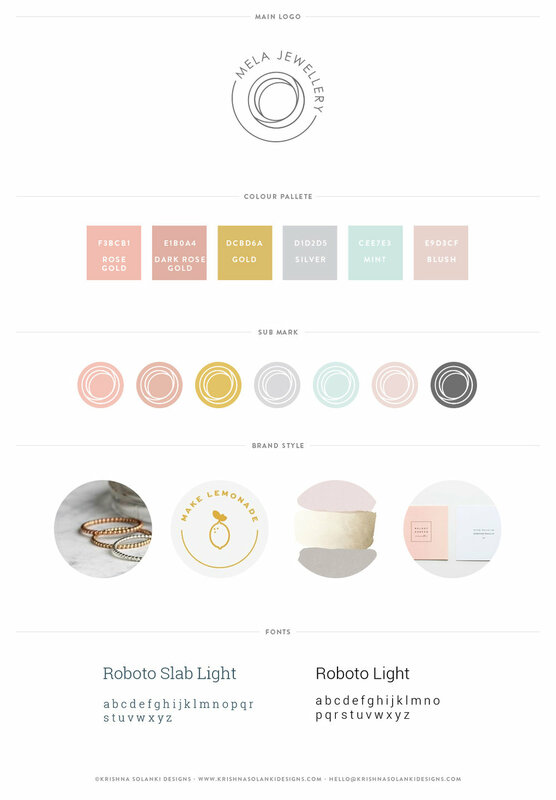 The first step in a rebrand or new branding project is to create a moodboard. A moodboard sets the style and look and feel of the project and helps to guide design decisions as well. It's a really valuable design element. Have you got a moodboard for your brand or business? Using the Pinterest homework, the keywords, and detailed information that Deepa provided in the branding workbook - this super helpful workbook helps my clients to really think about the future vision of their business, and it helps me gain a better understanding of their business and future vision, I am able to get a real understanding of the look and feel, and style, for the new brand for the Mela Jewellery moodboard. The colour palette oozes soft delicate pastel shades which really aligns with the vision of the new brand. I absolutely love this stage of the project. Actually, I love all the stages, but this one is my favourite. Designing the logo concepts. From the moment I reviewed Deepas homework, I already had some great ideas for the new logo. My process includes creating 2 logo variations, which will be further refined over 2 revision rounds once a concept has been chosen to develop. Each logo concept incorporates the brand values and future direction of the brand as well. This is important to include so that the logo delivers longevity. Before I jump straight into Illustrator I usually have a play around with pen and paper (yes, good old traditional tools!) and sketch down my initial ideas. 80% of the time my initial ideas are digitised and presented as real logo concepts. I always present my logo concepts in black and white as design is very subjective, and I wouldn’t want the use of colour to influence the logo choice decision. This also helps when it comes to choosing a route to develop. By taking out the colour, you are naturally made to look at the core components of a logo. I was thrilled when Deepa chose the same concept to develop as the one I had in my mind as the best-suited concept. It was concept 1, in case you were wondering. With every project, I always provide revision rounds at different stages. This is essential in ensuring my client is happy with the designs and the deliverables before the final version is signed off. Deepa provided really great feedback, clearly listed and bullet-pointed each amend. 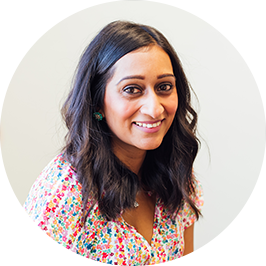 One of the best things about Deepas feedback was the reasoning behind her feedback - it gave me a better understanding of her thinking, which meant I was really able to create something better for her business. Deepa’s requirement for her new brand was for primarily a new logo and a refreshed colour palette. Therefore, the Mini Brand Identity package - a retired package of mine now! Sorry! - it includes fewer design deliverable items than in the Brand Identity package. Usually, once the logo has been signed off, I create the logo variations, a submark, a pattern and other brand elements (like bespoke icons if they are required) as part of the larger, Brand Identity package. These elements really bring a brand to life and can be used in various places - the website, print collateral, marketing material, social media images.. My list can go on! For Mela Jewellery, I created a mini brand board and business cards. The business cards doubled up as thank you notes, which is such an awesome idea as Deepa includes these in all her packaged boxes when she sends her beautiful items to her customers. I could tell Deepa had thought about her requirements properly and used this opportunity to get professionally designed cards. She had gone one step ahead and added a “caring for your jewels section” on one side of the business card which is such a wonderful idea, not to mention great use of resources too! The mini brand board was the final element in rebranding Mela Jewellery and bought all the designed elements together. Mela Jewellery - New Logo in action! Working with Deepa was amazing, it was an absolute dream of a project at the right time for me as well. The Mela Jewellery mini rebrand will be one of the highlights of my design career as it marked a new stage in my personal and professional life. Totally one of my favourite projects of 2018. I was after a new logo and brand for my jewellery business, Mela Jewellery. Working with Krishna was a pleasure. She's so nice and everything is so clear - timings, steps, sign off. It made it easier for me to fit in with my schedule. I love my new logo and brand. It really makes my business look more professional and suits my audience so well. The new logo has given me more confidence in presenting my brand and all the feedback has been really positive. I definitely recommend Krishna, in fact I already have! Are you interested in working with me on the design of your brand and website? Why not check out my Work With Me page for more information on my packages, prices and process, my Portfolio for a look at my most recent work, and my Contact page to get in touch!